Flowers are one of those things that I love but don’t buy as often as I’d like. When I do, I always think, “I really need to do this at least once a month.” It’s the same thought that runs through my mind after getting an aromatherapy massage. While scheduling a massage isn’t something I typically do to kick of Spring, buying tulips, however, is what I do…always. In between my shopping errands yesterday, I picked up a freshly cut bouquet of tulips from my local supermarket. 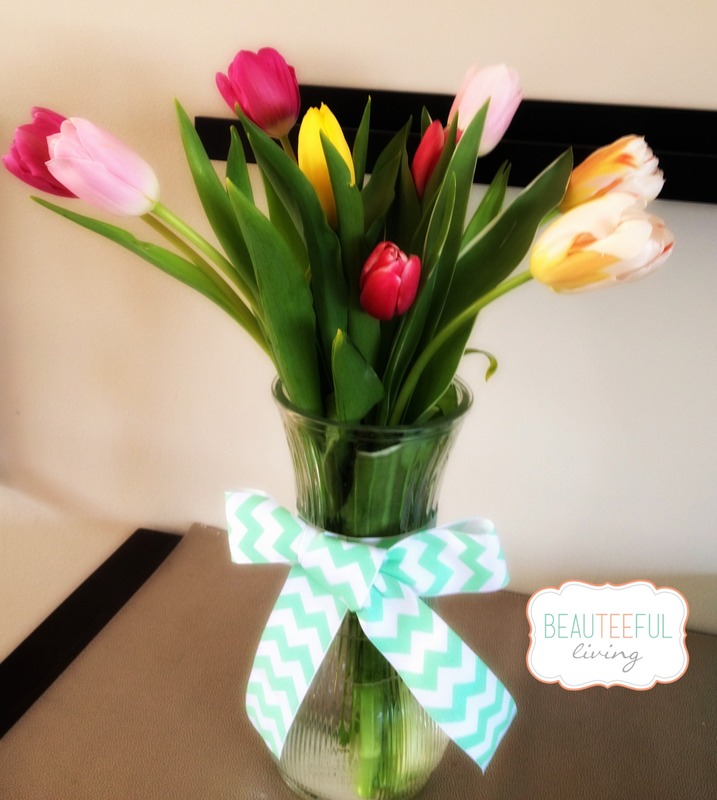 Adorning the vase with a pastel chevron bow helped make the look complete. Total cost? Just $8.99 (tulips were $6.99 & spool of ribbon was $2.00). A tiny cost for days of enjoyment. Unfortunately, tulips aren’t known to be long-lasting flowers but with proper care, they can sometimes last up to 10 days. 1) Using a sharp knife, trim off any white part of stem to allow better water absorption. 2) Place tulips in a vase filled with clean water and fresh flower food (see homemade recipe below). 3) Remove any foliage from stem that is submerged in water. This avoids mold and bacteria. 4) Re-cut approximately 1 inch of the flower stems every 3 – 4 days. Note: Make sure to check the water in the vase often. Plenty of fresh water is key to prolonging a tulip’s life. Mix 2 tablespoons of white vinegar and 2 tablespoons of sugar into 1 quart of water. This recipe will feed the flowers and also curb down the growth of bacteria. Wow they add so much color to your house! sugar and vinegar. who would have thunk it. thank you for sharing. You’re very welcome! A tulip festival sounds so nice. One of the many great things about living in the ‘burbs. I’d love to see pictures from the festival :). Tulips are my favorite flowers! Going to our town’s Tulip Festival in a few weeks. Thanks for the tip on how to keep them longer!